Cleveland Amory, founder and guiding force of the Fund for Animals, died at his home in New York City on October 14. He was 81. Raised in a world of comfort and privilege, Cleveland embraced a life of extraordinary utility and service to the cause of animals. Through his novels and nonfiction writings, he earned a cultural celebrity unmatched by any contemporary animal advocate. Brash, colorful, physically imposing, and self-confident, he was one of the most important critics of hunting, trapping, and the fur industry in the postwar era. Born in 1917 to an established and affluent Boston family, Cleveland spent the first half-century of his life as a social historian, novelist, satirist, and cultural critic. His three chronicles of high societyThe Proper Bostonians (1947), The Last Resorts (1952), and Who Killed Society? (1960)are classic works of Americana. The resulting acclaim led to a career as a columnist and television critic with the Saturday Review, TV Guide, and Parade, and to a continuing role as social commentator for NBCs Today Show. When he first embraced the cause in the 1950s, animal protection in the United States was emerging from a long period of atrophy and impotence. The formation of the Fund for Animals in 1967 was a benchmark in the revitalization of the humane movement, and Cleveland did as much as anyone to alter its insular character. Almost instantly, the Fund became a powerful force for good in animal protection. Among other accomplishments, Cleveland recruited a number of prominent celebrities like Mary Tyler Moore to the work, putting them to use in campaigns against trapping, the wearing of fur, and the clubbing of baby seals. The 1974 publication of Man Kind?, an all-out indictment of hunting and wildlife "management," established Cleveland as the hero of many who deplored the devastation of wildlife in America. During the 1970s, an energetic network of field representatives made the Fund for Animals one of the most dynamic of the national organizations, and set the stage for the expansion of grassroots activism in the decades to follow. During the 1980s and 1990s, Cleveland continued to attract hard-working activists who helped to solidify the Funds reputation as huntings number-one enemy in the United States. In addition, Cleveland placed the organizational resources and reputation of the Fund behind some of the most challenging and controversial initiatives of the era. He was an early and stalwart backer of the aggressive campaigns waged by Paul Watson and the Sea Shepherd Conservation Society against whaling and sealing. In the early 1980s he opened the Funds treasury to underwrite an ambitious removal by air and land of 580 Grand Canyon burros slated for destruction by the National Park Service. Later, he fought a similar battle to prevent the killing of San Clemente Islands goats by the Department of Defense. Under his leadership, the Fund kept pace with the changing circumstances and fortunes of animal protection in America. Its abolitionist stance against hunting made it especially popular with the thousands of self-identified animal rights advocates who swarmed to the cause during the 1980s. Fund activists were among the first to challenge hunter harassment laws in states like Connecticut and Maryland, and in 1990, the Fund stepped into the fight to halt pigeon shoots in Pennsylvania and other states. In an unusual convergence of his lives as Boston aristocrat and animal rights advocate, Cleveland lent his name and energy to a decade-long struggle to expel corrupt leadership from the New England Anti-Vivisection Society. Cleveland was one of the most popular speakers in the animal rights movement, and at his conference and public appearances his wit and passion were always on display. His self-identification as a curmudgeon set the tone for most of the anecdotes he told about his work in animal protection. He was a masterful storyteller, combining a strain of self-deprecating humor with a more acerbic brand that he directed at animal exploiters with whom he came into contact. His engaging sense of humor also made it easier to resolve the differences of opinion that sometimes separated him from other strong-willed animal advocates. 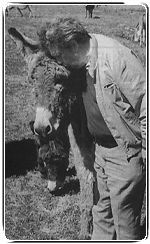 In 1980 Cleveland founded the Black Beauty Ranch in Texas, named for the Anna Sewell novel that had inspired him and so many other humanitarians. Soon Black Beauty became the final destination for a legion of mistreated and unwanted animals, and the creation of this place of happy endings gave Cleveland special satisfaction. It was also the subject of his work, Ranch of Dreams (1997). In 1987, with The Cat Who Came for Christmas, Cleveland struck gold, as the story of the abandoned cat he encountered in a New York alley was an instant best-seller. With its two sequels, The Cat and the Curmudgeon and The Best Cat Ever, Cleveland earned a place in the pantheon of Americas greatest cat authors. His chronicles of life with Polar Bear (1977-1992) were entertaining narratives about the human/animal bond. But the three books also shared the broader work of the Fund and its animal defense and rescue activities with a mass audience. In accordance with his wishes, the man who wrote them was laid to rest beside the cat who inspired them at the Black Beauty Ranch. Here, a few of Clevelands long-time friends and colleagues share their remembrances. "Cleveland was more than a just charmer; underneath his humor, he was a serious man, always seeing four steps down the road." "Placing principle over career, Cleveland embraced animal protection when the cause was perceived as unpopular and a bit bizarre. When the history books are written about the animal protection movement in the 20th century, he will stand tallest, rightly referred to as the grandfather of the movement, since he adopted the movement when approaching the age of 50." "Cleveland did more than anyone to discredit hunting, trapping, and the wearing of fur, and to make them unfashionable and indeed grotesque to so many. He did all this with devastating wit and incredible couragehe was never afraid to go anywhere, do anything, take on anyone to help animals." "He struggled with every step to get to the shooters area (against my advicethe risk factors were so high, you would have better chances walking on a minefield) because he wanted to see for himself what was probably the biggest collection of dysfunctional lifeforms on the planet, and this sport they engaged in." "As one of the first Fund employees back in 1970, I watched as Cleveland single-handedly convinced the country that we in the animal movement were many thousands strong. At the time, we were far from it. But in the following years, his vision, his inspiration, and his persistence really did raise a veritable army of little old ladies in tennis shoes... And as we all got a bit tougher, he amended that to little old ladies in tennis shoeswith cleats. "
"He was highly effective because of his tremendous ability with words. Take [the Funds slogan] The Right to Arm Bears. This is what really distinguished him from others in the movement." "He came to Hegins in 1992 and, as was typical of Cleveland, he would get upset when he saw examples of animal cruelty and he reacted strongly to seeing the shoot. Yet at the same time, as was also typical of Cleveland, he quipped that in Pennsylvania they would shoot their own mother if she had two wings." "We wouldnt be out here protecting whales today if it wasnt for Clevelands help years ago, which laid the foundation for our work. He was like a father to me." "One of my fondest memories is calling him for ideas on a press release about koalas. Off the top of his head, he came up with the epitomic statement about these animals: If we cant protect an animal as charming as the koala, what chance do the homely animals have? "